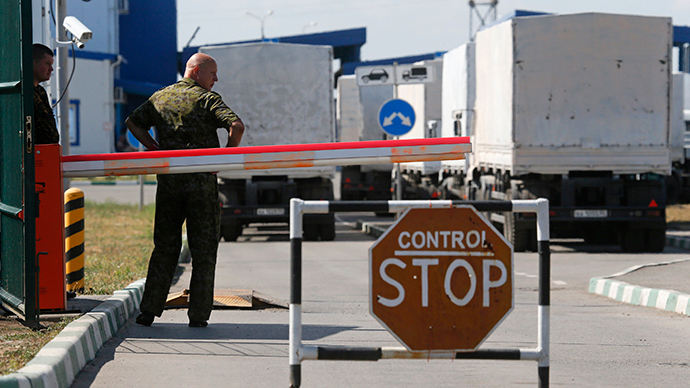 Trucks with Russian humanitarian aid to war-torn eastern Ukraine are going through customs at the border. Following a delay caused by the Ukrainian side, the convoy may finally start moving to its destination on Friday, a Red Cross official said. The first four Russian vehicles carrying humanitarian cargo have undergone customs clearance at the Russian border checkpoint ‘Donetsk’ in the Rostov region and are now being processed by Ukrainian customs officials at the Izvarino checkpoint, reports RIA Novosti. Following about a week of delay, the aid convoy may set off on Friday for its final destination - Ukraine’s Lugansk region. The vehicles will be accompanied by ICRC vehicles throughout the trip. “Only a driver should be inside each truck cabin. Stops are not allowed throughout the route. The column is also accompanied by medics in case there’s need for first aid treatment,” the Russian Emergencies Ministry press service said. Earlier, representatives of the International Committee of the Red Cross instructed the convoy’s truck drivers on safety. 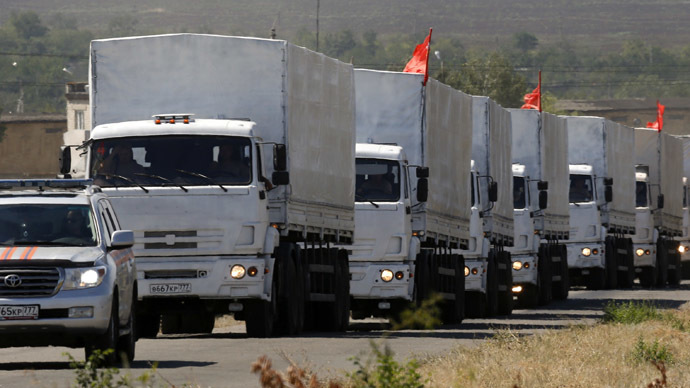 A total of 280 vehicles carrying Russian aid to Ukraine left the Moscow region on August 12. Since August 14, the trucks with their cargo – such as medical supplies, food, baby food, sleeping bags and other basic necessities – have remained stranded at the Russian-Ukrainian border. The convoy has been waiting for final approval from the Ukrainian authorities, who kept postponing the process citing security concerns. #AidConvoy: #Ukraine border guards have started inspections of the first #Russian trucks, we are observing. Trucks should roll tomorrow. 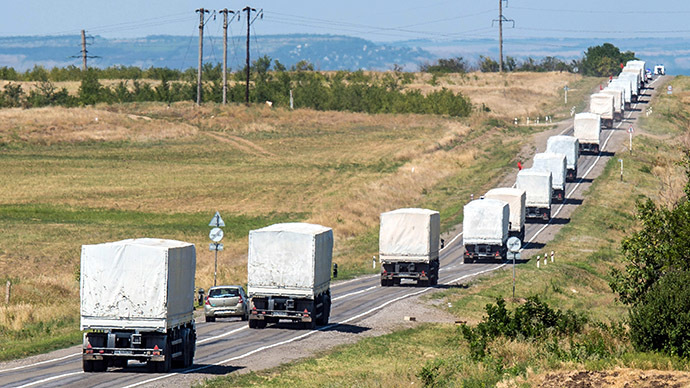 After all the procedures of cargo customs clearance and inspection of the trucks by the ICRC had been agreed upon, and the paper work had been done, the first 16 Russian aid trucks finally moved to the Russian border checkpoint ‘Donetsk’ in the Rostov region. However, it was only on Thursday that the Ukrainian customs service started clearing procedures. The ICRC blamed the Ukrainian side for the delay in the delivery of Russian aid to people in the conflict zones. 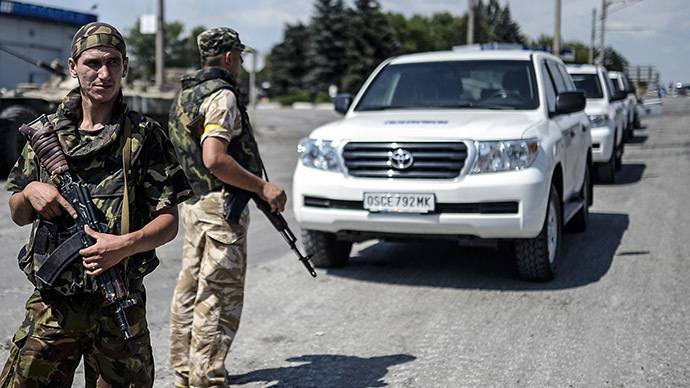 The organization “regrets that customs checks – which had been agreed between Russian and Ukraine – were delayed due to Ukraine’s fault,” Laurent Corbaz, head of ICRC’s Department for Europe and Central Asia told reporters on Thursday, as cited by Itar-Tass. The official expressed hope that the humanitarian aid column would set off on Friday. The Red Cross also called on all the sides involved to speed up the necessary procedures so that aid can reach those who desperately need it in Ukraine. According to the organization, people in areas affected by the ongoing conflict are in “urgent need for essentials like food and medical supplies.” Reports also indicate that the city of Lugansk has neither water nor electricity due to damaged infrastructure. The Red Cross also urged the conflicting sides in Ukraine “to take constant care” to spare the civilian population and civilian targets. “Equally, each party to the conflict must, to the extent feasible, avoid locating military objectives within or near densely populated areas,” the ICRC said in a press release on August 21. Moscow has welcomed the final agreement reached on aid delivery after “tough” talks, the Russian Foreign Ministry said in a statement. The ministry thanked the Red Cross for its “active cooperation” adding that the top priority now is to make sure that the convoy safely reaches its destination. Russia also warned against any provocations aimed at foiling the delivery of the aid. It has called on the conflicting sides in Ukraine to cease fire for the period of the convoy passage. “We suggest that the UN Security Council adopts a statement on the issue,” the ministry stated. The safety of the aid convoy was among key issues discussed during lengthy negotiations between the Red Cross, Russian and Ukrainian officials. Russia, Kiev and militia forces in eastern Ukraine have all said they are ready to ensure the safety of the convoy, the ministry said. Moscow repeatedly denied Western allegations that its humanitarian mission could be used as a pretext for military intervention into Ukraine. The cargo has been recognized as humanitarian by both the Red Cross and Kiev. “As multiple checks of vehicles revealed, there isn’t any undeclared cargo carried by the convoy and it will not be accompanied by the military when traveling in the Ukrainian territory,” Russia’s deputy Defense Minister Anatoly Antonov pointed out during a meeting with Laurent Corbaz of the Red Cross, reports Itar-Tass. Watch RT’s Maria Finoshina report from Lugansk, a city suffering daily shelling by the Ukrainian military. Many civilians – mainly the elderly, sick, or those who have nowhere to go – are still living in buildings damaged by the attacks, obliged to look for shelter in basements.